As New Zealand’s record try-scorer and not long out of a 62-cap Test career, Howlett made an ideal mentor to his fellow winger, who was then 20 and a few months away from making his Ireland debut. Things happened fast for Earls. He was on the bench when Munster won the 2008 Heineken Cup and scored with his first touch in Test rugby, against Canada that November. That match was played at Thomond Park, a fitting stage for a player whose surname was already revered in Limerick because of his father. Ger Earls was a carpet-layer and tough-as-nails openside who scored the winning try on Young Munster’s greatest day – their 1993 All-Ireland League triumph. Paul O’Connell overlapped with Ger at Young Munster and he admits in his book that it took a long time to get used to the fact he was in the same team as one of his heroes. Fifteen years after playing alongside Ger, O’Connell suffered an injury that ended his World Cup (and ultimately his career) and he found a certain solace in the fact that the roomie looking after him in camp – helping him to dress, fetching his food – was Keith. So the baton keeps passing on. From his first days at Thomond RFC’s U8s, Earls has now scored more World Cup tries (eight) than any other Irishman, the fourth most for his country (26) and the most for Ireland in a season (nine, in 2016-17). If he richly deserves his reputation as a game-turner, he has also incurred more than his share of injuries, hence why a century of caps remains some way off for the now 30-year-old. At 85.91kg (Munster’s website is remarkably precise), Earls is a relative lightweight and arguably more vulnerable to the rigours of the pro game. Howlett, though, wouldn’t have it any other way. “What I love about Keith is that in a modern-day game of giants, where it’s all about size and how much you can lift, he makes a place for players of speed, skill, guile, and with a game sense. The All Black recalls having to be on his guard in training. “He could make people look silly at the drop of a hat: in terms of beating you, sidestepping you, making you fall over trying to tackle him. Such belief instils confidence in others, helping the team to be more than the sum of its parts. And at the root of it all is a desire to perform for his province. 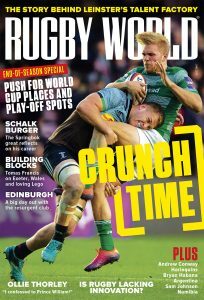 This article originally appeared in the March 2018 edition of Rugby World magazine. Follow Rugby World on Facebook, Twitter and Instagram.